The Periodic Table is called this not just because it is a table of the elements, but because it is arranged to reflect the periodic trends of the elements. 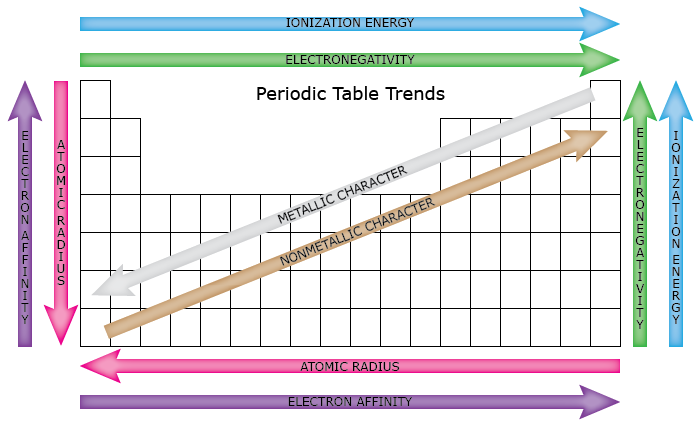 This table shows the periodic table trends of six different physical properties of the elements: atomic radius, electron affinity, electronegativity, ionization energy, and metallic/nonmetallic character. Atomic radius is half the distance between two identical atoms touching each other. As you move across the periodic table from right to left, each element contains one more electron and one more proton. The electrons form shells and are attracted strongly to the positive charge in the nucleus, pulling the shells closer to the center and effectively making the atom smaller with the addition of each proton. As you move down the periodic table, the valence of the the atom remains the same, but there are more filled electron shells between the outer electrons and the positive nucleus. These outer shells are shielded from the positive charge of the nucleus by layers of electrons and the effective charge they experience is less than the element above them. The outer electrons are not held as tightly as the outer electrons of the elements above them on the table. Electron Affinity is the ability of an atom to accept an electron. It is measured by the energy change in the atom as an electron is added to the gaseous form of the atom. Atoms with stronger nuclear charge tend to have higher electron affinities as you move across the table. As you move down, the outer electron is both shielded from the nucleus by filled shells and physically further away. Both of these reduce the force of attraction between the nucleus and the added electron. Electronegativity is the measure of attraction between the atom’s nucleus and electrons in a chemical bond. In general, the higher the electronegativity, the stronger the force of attraction between bonded electron and the atom nucleus. A related term is electropositive. Think of it as the opposite of electronegativity. Atoms with low electronegativity are highly electropositive. Ionization Energy is the energy needed to remove an electron from a gaseous atom. The tighter the nucleus holds an electron, the more energy needed to remove it. Metallic and Nonmetallic Characteristics are a group of physical properties. As you move up and across from the bottom left of the table, the elements begin to take on the characteristics of nonmetals. Moving the opposite way, the elements take on properties of metals. For a more detailed examination of the difference, check out metals, metalloids and nonmetals.